Nokugcina Elsie Mhlophe known as Gcina Mhlophe was born on 24 October 1958 in KwaZulu- Natal, South Africa. She has been writing and performing on stage and screen for the past 21 years. Gcina Mhlophe has written many children's books as well as adult audience poetry and short stories and plays. Her writings are published all over the world and translated into German, French, Italian, Swahili and Japanese. Her work is used extensively in many schools and universities. Gcina produced and performed in the collaboration CD for children with Ladysmith Black Mambazo - released by Music for Little People in America, 1993. She has written music for the SABCTV series Gcina & Friendswhere she performed her own stories for television audiences. 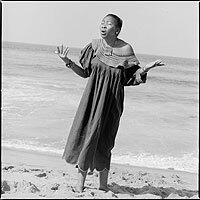 In 2000 she released an award-winning storytelling CD called Fudukazi's Magic for German audiences. Gcina wrote both the story and music for Fudukazi's Magic, that was also produced for video in collaboration with Anant Singh of Video Vision. She has also written both story and music in collaboration with guitarist, Bheki Khoza, for the Animated Tales of the World Series, which featured in Right Angle in the UK as well as the SABC. In 2001 her CD and book of Nozincwadi Mother of Books was produced as part of her nationwide reading road show to South African rural schools. Her work has received awards from BBC Africa Service for Radio Drama, The Fringe First Award in the Edinburgh Festival, the Josef Jefferson Award in Chicago, and OBBIE in New York. Gcina Mhlophe has received Honorary Doctorates from the London Open University as well as the University of Natal. This year sees the publication of her book and CD, African Mother Christmas by Maskew Miller Longman, as well as the republication of Love Child (now in English), and Have You Seen Zandile by University of Natal Press, the latter two being launched at the Time of the Writer 2002 festival. The video of “ FUDUKAZI’s MAGIC” was screened for the public in Durban as part of the African Union Film Festival, July 2002. Her work has contributed in preserving storytelling as a means of keeping history alive and has encouraged South African children to read.